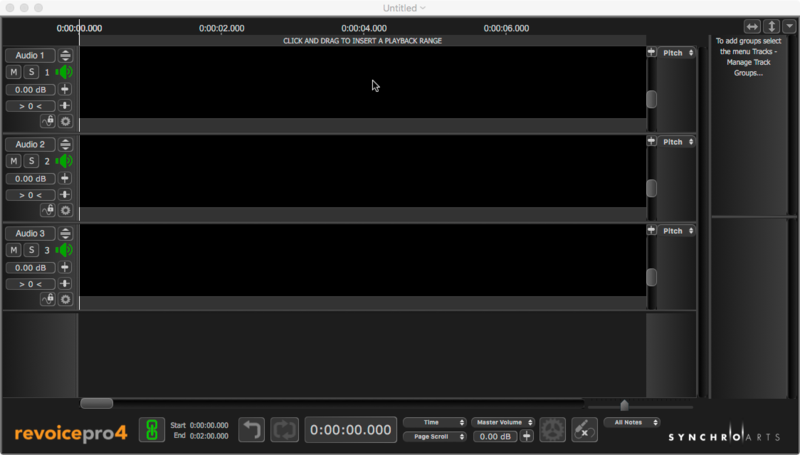 When Revoice Pro starts, it opens an empty three-track Session window as shown below. However, Revoice Pro supports multiple windows which can contain either different Sessions or additional independent views of the same Session. In addition, Revoice Pro can contain an unlimited number of Tracks. But, unlike traditional audio editors, each Revoice Pro Track contains a large area for displaying the audio and optionally energy, pitch and loudness, and a smaller area under the main area that holds the Process Control Blocks. The multi-track view can be switched to view a full-height single track by using Single/Multi Track display control in the Track Control Panel.